Spring is in the air and we know you've been hard at work getting your yard back in shape! We want to see how lighting has illuminated your spring night! Snap a photo of your home, garden, pathway, or any space that features VOLT® Lighting products. Then enter your photos here for a chance to win in our Spring Photo Contest. For best results, take your photos at Dusk! 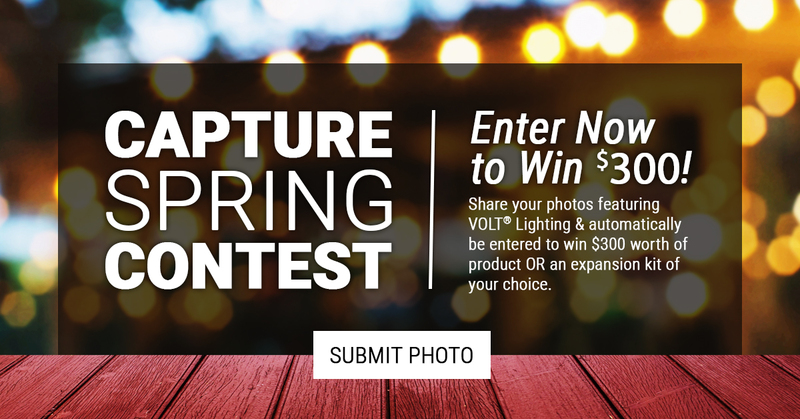 Submissions will close on April 30th at 11:59PM EST, and one winner will be able to choose between $300 worth of VOLT products or choose a VOLT Lighting expansion kit of your choice! The winner will be announced by May 3rd. Photos will be judged based on the quality of images, how it pertains to the current theme, and overall presentation. Read full rules and restrictions below. Stay Up To Date On Everything VOLT! This promotion is managed by VOLT Lighting. Participation in this promotion is subject to the official rules.